Only the attic remains to be renovated in the eBay house. The house is now taking on a distinct American Victorian feel, even a little gothic with its rich dark wall papers. I cut two small walls to divide the attic into two rooms and a corridor. The decision to make three spaces in the attic took most of the day. 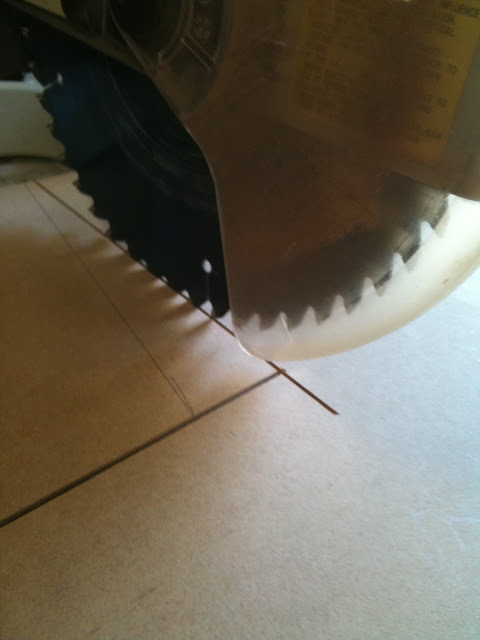 The drop saw made short work of cutting the walls from a large sheet of MDF. I'm so glad I have my parent's power tools on hand for this type of work. It took a while to get the angles right and make them fit. I couldn't help but ad some furniture to help imagine how the finished product will look. Then I started on the doors. I have had enough of pre made door frames. They are too chunky and come with a large threshold, which isn't very realistic. I have resolved from now on to make my own door frames (keeping the doors though). Wish me luck! I have cut and laid out all the architraves for painting and finishing tomorrow. Tomorrow will come the hard task of deciding which wall papers to use. I have been thinking about it all day but still can't make up my mind. Very difficult decisions..
Good luck with choosing the wallpaper! Thanks for the encouragement Elga! Creating doors will be tricky - specifically the part where I hang the door and try and get it to swing properly! I do mosts things through trial and error - but if it works well, perhaps I will try my first 'tutorial'. You are doing such an icnredible job on the house. I totally agrree about pre made doorframes...I made all of mine from scratcha nd while it was a lot of work it really changes the look and realistic quality of a dollhouse. Keep up the fantastic work and I look forward to seeing whis of hose wonderful appers you choose.